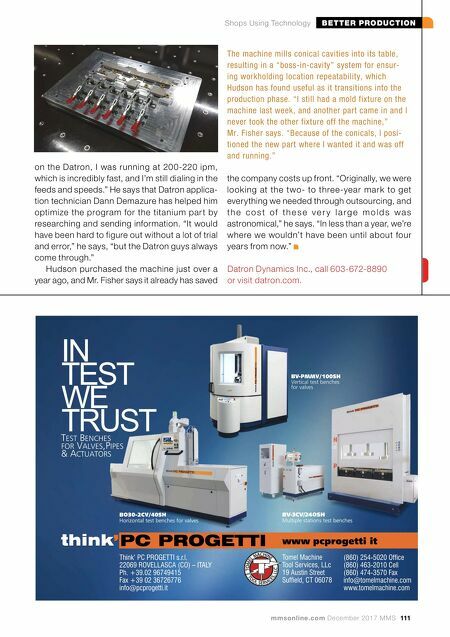 BETTER PRODUCTION Shops Using Technology mmsonline.com December 2017 MMS 111 on the Datron, I was running at 200-220 ipm, which is incredibly fast, and I'm still dialing in the feeds and speeds." He says that Datron applica- tion technician Dann Demazure has helped him optimize the program for the titanium par t by researching and sending information. "It would have been hard to figure out without a lot of trial and error," he says, "but the Datron guys always come through." Hudson purchased the machine just over a year ago, and Mr. Fisher says it already has saved the company costs up front. "Originally, we were looking at the two- to three-year mark to get everything we needed through outsourcing, and t h e c o s t o f t h e s e v e r y l a r g e m o l d s w a s astronomical," he says. "In less than a year, we're where we wouldn't have been until about four years from now." 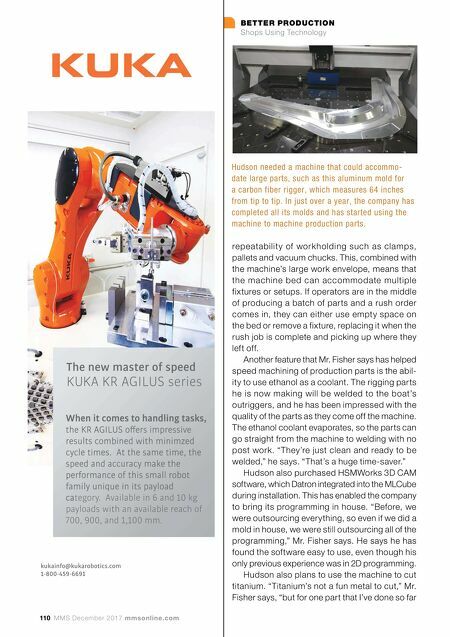 The machine mills conical cavities into its table, resulting in a "boss-in-cavity" system for ensur- ing workholding location repeatability, which Hudson has found useful as it transitions into the production phase. "I still had a mold fixture on the machine last week, and another part came in and I never took the other fixture off the machine," Mr. Fisher says. "Because of the conicals, I posi- tioned the new part where I wanted it and was off and running." Datron Dynamics Inc., call 603-672-8890 or visit datron.com.